Xbox's Major Nelson has added further details about the plans to upgrade the Xbox 360's dash, with voice control support, cloud saving and Bing search all on the way. As promised in its E3 press conference, Microsoft is set to add the above-mentioned new features to the Xbox 360 in a dashboard update sometime later this autumn. Xbox Live's Larry "Major Nelson" Hryb has added further detail on Microsoft's plans to use Kinect on Xbox 360 in a variety of new ways. The new dashboard is, according to the Major, "simpler, cleaner and easier to navigate…with a new look and feel that makes it even more open, inviting and intuitive to navigate. All of your favorite content is categorized in a way that is easy to browse and find what you're looking for, plus you can use voice anywhere in the dashboard to effortlessly navigate and get to what you want." 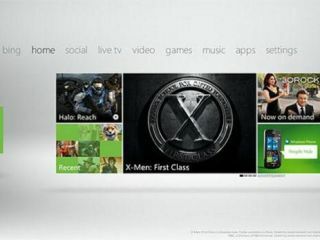 Nelson then talks about bringing Bing to Xbox, explaining that: "Bing on Xbox searches Netflix, Hulu Plus, ESPN, as well as our music, video and Xbox LIVE marketplaces to find exactly the entertainment you want to enjoy. With Bing on Xbox and Kinect, you can effortlessly find the games, movies, TV shows, sports and music you want by only using your voice. You say it, Xbox finds it. The experience is now simpler than ever before." And voice support is key to the new Xbox 360 interface, with Microsoft "committed to bringing voice to eight additional markets by the end of this year with a total of 13 markets that will have Kinect voice." Beacons are another new addiction to Xbox Live, which are essentially new ways of flagging to your mates what games you want to play with them. Finally, cloud storage for your Xbox game saves and your Xbox Live profile is also on the way later this year. "Here at Xbox Live we listen to your feedback," says the Major. "We are making it easier for you to sign into your Xbox LIVE account from any console at any time to access your game saves and full profile, including items such as Microsoft Points to make purchases, Achievements and friends. Gone are the days of "gamertag recovery." Now all you need to do is sign in, no matter where you are!" You can get all the details on Microsoft's E3 press conference from our earlier news feature.